There is a new trend in Mumbai restaurants. Everyone is reinventing street food, putting their own twists and turns on age old favourites. "The Spare Kitchen" serves a Chowpatty platter that has some beautifully presented vada pao, bhelpuri and pani puri shots. "Masala Library" is putting a molecular twist on sev puri. My favourite reinventions so far are in the Juhu open air pub - Copa. Their ragda pattice redux is delicious and I have become a big fan of their pao bhaji toasties. 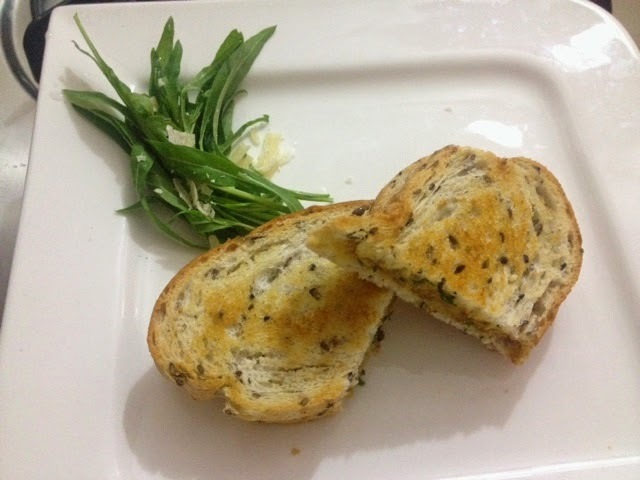 But delicious as they are, these toasties come slathered with a huge quantity of butter so I tried making a healthier, yet equally delicious version at home. First, you make pao bhaji. Next, you take two slices of whole wheat or multi grain bread. I am using a ciabatta here. Apply ghee or butter on one side of both slices of bread, as sparsely as you can. Spread a layer of pao bhaji on the unbuttered side of one of the bread slices. Next, grab a handful of arugula and cut it into thin strips with scissors. Arrange on the pao bhaji. Also take a small onion and dice it into small pieces. Sprinkle the onion all over the pao bhaji/arugula. Now if it was a real pao bhaji, you will add some lime juice before you eat it. In this case, grab a tsp of balsamic vinegar and sprinkle it over your sandwich. Top with the second slice of bread, buttered side up. You can toast this in a Panini grill if you have one. If you don't (like me), what you do is heat up a flat griddle - a tawa - and reduce the heat to very low. Put your sandwich on the griddle and cover with a plate or a lid, pressing down a bit. A couple of minutes later, flip and cook the other side. Repeat until both sides are crisp and browned. I serve this with some more arugula, parmesan and even more balsamic poured on the salad.